I love websites that really engage you. Kathy Sierra, a SXSWi regular, talks about Creating Passionate Users and how you can do that by making them feel like rockstars. 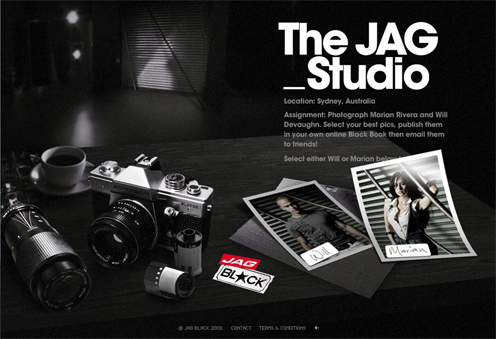 The JAG Black jeans website made me feel like a rockstar photographer for a brief 5 minutes and here’s how they did it. 1.The homepage lets you choose between a male and a female model. I picked Marian. 2. A brief instruction screen kicks off the photo shoot right away. Shooting is as simple as moving the camera with your mouse and clicking. 3. I create a magazine layout based on all the photos I took of Marian. 4. A personalized photo book is created ready to be shared with all my friends. Notice the personalized icon on the top left of the left page. You can flip through the 3D magazine like a real book. The camera is loose and enhances the sense of realism further engaging you. (For you RIA geeks, this was probably done using Papervision or Away3D). What made this microsite successful was that it made me feel accomplished. In about 3 minutes (which is about all the attention span I have nowadays), I went from picking a model, doing a photo shoot, and creating a magazine layout. I was the decision maker at every key point. And before I even knew what hit me, I had infected all my friends with this viral campaign by sharing my custom photo book with them and repeating the cycle all over again. Check out the website here. If you haven’t seen Kathy Sierra’s talk “Creating Passionate Users”, you should check it out.